Bristol, Virginia is a small town of under 20,000 and directly across the state line from Bristol, Tennessee. 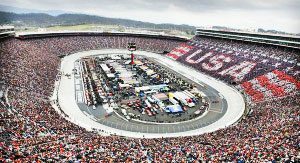 The area does not have much industry, other than the NASCAR racetrack that brings in thousands of tourists twice a year. The area around Bristol has been economically depressed for years, and business people are looking for opportunities. The largest employer in the area is the city of Bristol, which means there are many people in the area still looking for jobs. A group of developers from the area has plans for the defunct mall—to turn it into a casino. A local senator from the area as well as representatives are introducing a bill that would allow the casino development in Bristol if the local residents approve it via a vote. The community and the developers have hired lobbyists to push for their casino gambling bid in the legislative session. Danville, Virginia a border town in the area of North Carolina and Virginia is another economically depressed area. Like Bristol, there are few industries in the area. A couple of factories exist in the area, such as Goodyear and Nestle, however the area needs additional industry. A coal mining concern, The United Company, is looking to diversify into the area, and has decided to pay for lobbyists for both the Bristol plan as well as the plan in Danville. While the Danville City Council does not know where the proposed casino resort will be located, the council says there are several tracts of land where a casino resort could be located. In contrast to Bristol and Danville, Hampton Roads is not located in a coal mining border region. While Bristol has 20,000 residents and Danville twice that amount, Hampton Roads is home to nearly two million people in the area. However, the reason Hampton Roads is interested in casino development to draw tourists into the area, and diversify its economy, which has relied historically on shipbuilding activities. The area, like Danville and Bristol, has been economically depressed, especially with the decline in shipbuilding. Unlike the other two communities, the Hampton Roads-Portsmouth area has been trying to get a casino for the last six years—but they have never been successful. This time, all three areas have bipartisan support for casino legislation, practically unheard of in the Virginia General Assembly. This push for gambling is being heralded by other areas of the state as well. Virginia sits in the middle of states where gambling is illegal. The state could get a leg up on possible competition from other states if it agrees to legalize gambling. There is going to be gambling in the state for the first time, Indian casino gambling. The Pamunkey tribe, recently recognized by the federal government, announced plans to open a casino on their newly acquired tribal land. Many counties in the state want to have the same chance as the federally acknowledged tribe. It remains to be seen if the other areas in the state who want gambling will get their wish.